Yes it’s cheesey, but the weather forecast is a perfect opportunity to crowbar in GoT…Temperatures are set to hit zero or -1C, depending on your choice of weather service. I’m not sure all my plants are able to cope with it. My greenhouse has been stuffed with pots – the fig’s in there too now, plus my only fuchsia. I figure that the pots crammed together and under shelter should create a micro-climate to keep them alive. It does mean that if I want to get in at all, a fair few need to be decanted from their sit-in on the path. I’ve harvested as much as I can, just in case, coming home with chillies, cape gooseberries, a small under-ripe squash and a massive bag of leaf chicory. 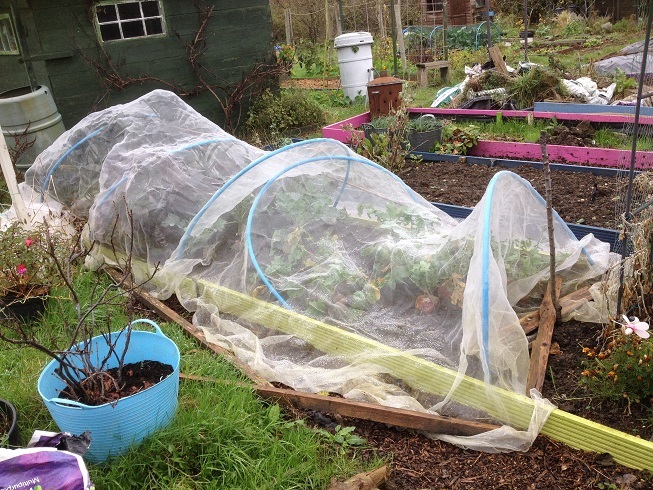 Storm Barney did for my brassica cage. When I got to the plot the mesh was slumped over the swedes and kale – at least still all in place. A quick repair was a bit pointless: the kale was already pushing at the top of the hoops as it was. The blue fruit cage is higher. In the interests of speed I tried moving the whole thing at once and on my own. It’s not very stable and rapidly fell to bits. When I did get it all in place it was too high for the mesh. Cue much bashing with a mallet, in the process smashing the bamboo canes which hold it together just a little bit. In the interests of speed again…I cut the massive (10m) piece of mesh almost to fit (ie really quite squint) but with some strategic rolling it all looks very smart. And the kale has about a foot and a half headroom. That was the only damage my plots had. 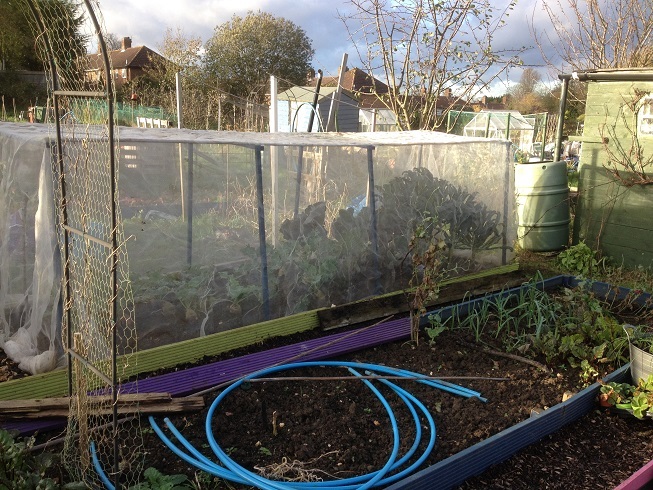 Thankfully I have nets over the leaves and most other things don’t seem to have moved. But Andie’s guttering is off, her window frames were all over the path and the panes had been blown over. She’s just next door, so I don’t understand why I don’t have more carnage. One of the guys had a massive open leaf pile near the bottom of the site and only about half of it is left. We had a delivery of woodchip today, mostly bay so it smells gorgeous. It is a bit too leafy though and I bet it won’t last long. The stuff I put down on #92 a few months ago is already almost rotted away. 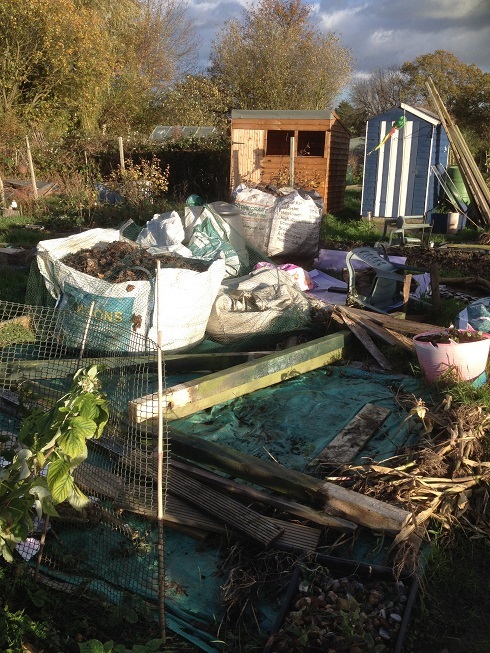 Before the truck offloaded I forked most of the more composted chippings in the bay to the back (so few words, so much backache!). If I remember (and more importantly, if no one else spots it…) in the new year this will be great stuff to put on the claggier beds. As it is the paths on #92 have been topped up so I won’t slip and slide when I’m giving my garlic another pep talk. With frosts forecast I took the seed circle aubergine home with me. Properly ripe it turned dull yellow instead of the beautiful white and lilac from its edible days. 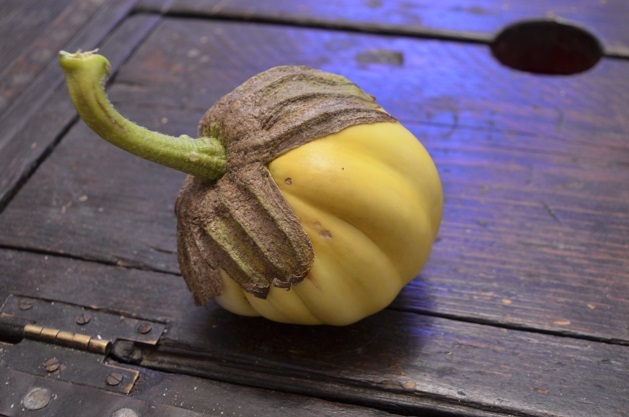 There was only one, and there are 1 6-odd people in the circle so I was hoping aubergines would be akin to squashes in terms of seed numbers. Unfortunately it’s not. I’m really pleased to have more Rosa Bianca seeds, but 29 seeds aren’t enough to share far. Still on the ‘to-do’ list, sow Meteor peas and Wizard beans – both in modules/trays to minimise mouse snacking. Loving the idea of giving your garlic a talking to!! sent from my smartphone so please forgive any typos.